Because IT departments need to ensure the security of information systems, their requirements can sometimes appear restrictive to users attached to their own independence and reactivity. Gathering Tools is a versatile solution that reconciles office practices with IT discipline and consequently improve data quality. With Gathering Tools, CIOs can easily convert Excel-based office processes into real “computer applications” and maintain good practices without changing the end-user habits. Both IT and functional departments find their interest in Gathering Tools. With Gathering Tools installed upstream of BI solutions, you have a versatile and cost-effective data-exchange platform immediately integrated with your work habits (no user training, no infrastructure impact). It lets you structure the incoming information, incorporating validation workflows, and automatically feed your multidimensional databases in real-time. 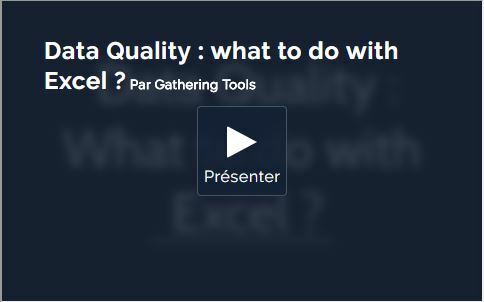 To discover how you can improve excel data quality and how Gathering Tools cover different functional departments such as finance, sales & marketing, human resources and internal audit, click here. Gathering Tools fits perfectly in the background (cf. shadow IT) of your BI and ERP solutions. It will help your project management teams to collect, structure, consolidate, monitor and validate data. Your data management policy is about to enter in a new era!